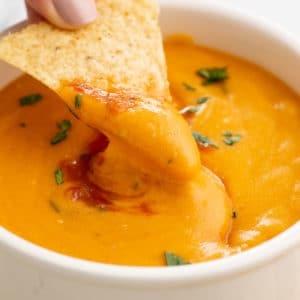 This delicious queso recipe is nut-free, dairy-free, and gluten-free! Potatoes, nutritional yeast, and all the delicious spices make this one-of-a-kind vegan recipe your new favorite snack. Add potatoes to a pot and fill with water until potatoes are covered. Add salt and bring to boil. Reduce heat and let simmer until potatoes are cooked through. To check for doneness, a fork should pierce through a potato with ease. Strain potatoes and add to the food processor. Add remaining ingredients and blend until completely smooth. Serve warm with tortilla chips. Leftovers keep for about 5-7 days in the fridge.